The most talented Starfleet engineers of two generations unite to solve a two hundred year old technological mystery that turns out to be only the beginning of a wider quest. With the support of Guinan and Nog, as well as the crew of the U.S.S. Challenger, Geordi La Forge and Montgomery Scott soon find themselves drawn into a larger, deadlier, and far more personal adventure. Helped by old friends and hindered by old enemies, their investigation will come to threaten everything they hold dear. 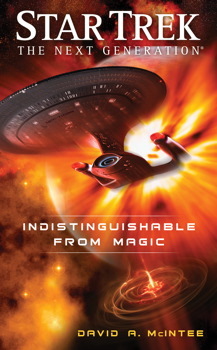 Seeking out the new, and going where no one has gone before, Geordi, Scotty, and Guinan find that their pasts are very much of the present, and must determine whether any sufficiently advanced technology is really indistinguishable from magic.